Willing to stomach a bit of risk? Here are three small companies that have track records of stock appreciation alongside steady dividend growth. Are you a bit bored with the sleepy trajectories of investments in multinational conglomerates? Want to add some torque to your dividend investments? Earlier this year, in an article on obscure dividend facts, I wrote about an Exchange Traded Fund (ETF) focused on the small-capitalization members of the Russell 2000 Dividend Growers Index, the ProShares Russell 2000 Dividend Growers ETF (NYSEMKT:SMDV). The Russell 2000 Dividend Growers is a fascinating index, as it borrows from the concept of "Dividend Aristocrats," i.e., stocks in the S&P 500 Index that have raised shareholder dividends for 25 years or more. The Russell 2000 version, and by extension, SMDV, focuses on small-capitalization companies that have notched annual dividend increases for at least 10 years. Promising small corporations within healthy industries often have the potential to grow at much faster rates than their large-capitalization counterparts. But investors should observe at least two risk caveats: Small caps tend to exhibit higher volatility, and they often trade at steeper earnings multiples, than mid- and large-cap stocks. 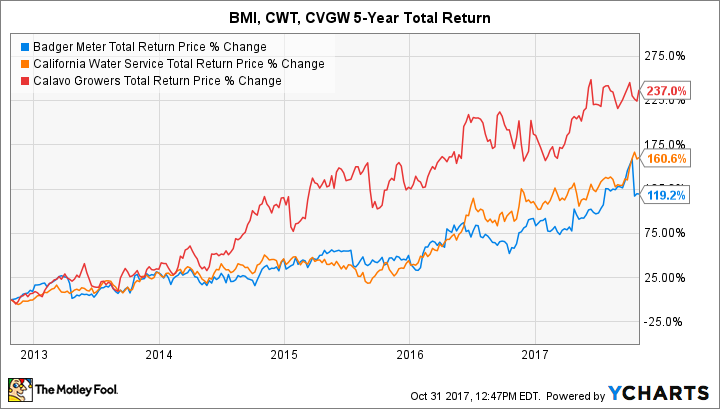 Keeping this in mind, let's look at three tiny, mighty dividend stocks that are part of the SMDV ETF's current holdings: Badger Meter, Inc. (NYSE:BMI), California Water Service Group (NYSE:CWT), and Calavo Growers, Inc. (NASDAQ:CVGW). We'll begin with a snapshot of their respective five-year total returns. Data source: Ycharts and Morningstar.com. All dollar figures in millions. "TTM" = trailing 12 months. Milwaukee Wisconsin-based Badger Meter specializes in flow measurement and divides its business between the sale of water meters and measurement technologies to municipalities, and devices that measure and control materials flowing through pipelines (i.e., water, air, steam, oil, and gases). Over the past five years, the company has increased its revenue at a compounded annual growth rate, (CAGR) of nearly 8.5%. Badger Meter has achieved steady growth by gaining market share in traditional water meter sales, and by developing more contemporary measurement devices that use radio and cellular technologies to cut out the need for manual water meter readings. Such automatic meter reading systems can be integrated with Badger Meter's cloud-based "Beacon" analytics software, which enables municipalities to provide end users with a dashboard-style app that tracks water usage, promotes conservation, and helps identify leaks. The company can be susceptible to commodity price fluctuations -- Badger's most recent quarter is a case in point. Despite record third quarter revenue, earnings dropped against the comparable quarter because of a 35% increase in the price of copper. That increase hurt because the company uses brass, derived from copper, in its meter manufacturing. While its earnings report caused a rather sharp drop of 12%, management has signaled that it will pass on the increase in copper and other components to customers over the next few quarters. Badger has a streak of 15 years of consecutive annual dividend increases. Recent years of outsize stock appreciation have compressed the yield on the company's quarterly payout of $0.52 per share. While shares can be volatile, Badger Meter's dividend discipline underpins its attractive total return potential. California Water Service acts as a holding company for six operating subsidiaries across California, Washington, New Mexico, and Hawaii, which provide regulated and non-regulated utility water services to over 511 million customers. The two largest subsidiaries, Cal Water and CWS Utility Services, account for nearly 93% of total company revenue. Like other small utilities, California Water Service increases earnings by maintaining efficient operations while winning reasonable regulated rate approvals. Last year, the company received approval from the California Public Utilities Commission for its 2015 three-year "general rate case." The ruling allows California Water Service its biggest rate increases in its 90-year history and authorizes $659 million in California water infrastructure projects for the three-year period ending in 2018, which will lead to additional revenue as the projects are completed. California Water Service's greatest attraction may be its ultra-stable dividend. In January, the company declared its 289th consecutive quarterly payout and increased its dividend for the 50th consecutive year. The company's dividend currently yields a modest 1.89%, a function of its swift 42% total return over the past 12 months. The company's present payout ratio of 50% is a bit below the 60%-70% range of recent years, indicating that earnings will continue to easily fuel the company's long streak of dividend increases. Risks include what seems to be a permanent issue in California because of climate change -- drier conditions that have led to extended drought. This situation drives up costs for water utilities. The company has coped so far by upgrading its technology and infrastructure, partnering with several state agencies to increase conservation in the state, and giving customers incentive to be more efficient with their water usage. Calavo Growers, headquartered in Santa Paula, Calif., is a leading purveyor of avocados to wholesalers, grocery chains, and food-service companies and has expanded in recent years into the market for value-added fresh foods. Initially formed as a growers' cooperative, Calavo grows and sources avocados primarily from California and Mexico through its biggest operating segment, knowns as "fresh products." Calavo has marketing agreements with over 1,900 avocado growers in California, and the company claimed a 28% share of the entire 2016 California shipped avocado crop. The company owns two fast-growing divisions which supplement its primary avocado distribution business: Calavo Foods, and Renaissance Foods Group, or RFG. Calavo Foods' primary business is the high-pressure packing of avocado pulp -- it's essentially a guacamole packaging operation that counts grocery stores, food-service institutions, and food clubs as customers. RFG specializes in fresh refrigerated packaged foods, including fruits, vegetables, salads, wraps, and sandwiches. Calavo Growers has expanded revenue at a CAGR of nearly 13% over the past five years. It's no wonder: The avocado is a nutrient-dense food that's the only fruit to provide significant amounts of healthy monounsaturated fatty acids. The avocado's expanding global market bodes well for Calavo, while also presenting periodic challenges. For example, in Calavo's most recent quarter, a poor California harvest resulted in a 34% decline in California-sourced avocado revenue. However, the company was able to offset this decline with an 80% revenue increase in its Mexico-sourced avocados. With a dividend improvement streak of only five years, Calavo Growers is one of the few stocks given an exception to the 10-year dividend increase rule in SMDV's holdings. On a forward earnings basis, it's not cheap, but Calavo's lucrative niche position in the avocado trade, coupled with growing revenue diversification, should solidify its position in the coming years as a true "dividend grower."